Creator of the MarTech conference and the MarTech infographic, Scott Brinker joins us this week in the Accelerator with his insights about where the marketing technology industry is going. Scott picks up three trends from the platform to ecosystem shift, to the interlocking of services with tech (and vice versa!) to the creation of no-coding apps that increase our ability to get work done. Scott even includes a special promo code for listeners who want to attend the Martech show coming up in San Jose in April 3-5, 2019. Allison Hartsoe: [00:32] Welcome everybody! Today's show is about Martech trends for 2019. The help me discuss this topic is Scott Brinker. Scott is the VP of platform ecosystem at Hubspot, but he's also the editor at Chiefmartech Dot Com and the program chair at the Martech conference, which if you haven't been to this fantastic conference, it is the intersection of marketing, technology, and management. I cannot think of a person more well qualified to talk about this topic. Scott, welcome to the show. Scott Brinker: [01:06] Thank you, Allison. Great to be here. Allison Hartsoe: [01:08] Can you tell us a little bit about your background and how you got drawn into the whole Martech system? Scott Brinker: [01:16] Uh, yeah. Uh, you know, happy accidents as they say. Um, yeah, so my background has always been as a software entrepreneur, particularly with the early days of the Internet, uh, ran a web development shop that helped to build solutions for some fairly large companies, companies like Citrix and Siemens. And so early on in the, in those days we would find ourselves being hired by the marketing department that wants to lead the charge with the company's a new website and new internet capabilities. And then it'll be my job to go and meet with their IT department down the hall to figure out how are we actually going to make this work. And so it was shuttling back and forth between these marketing teams and these Ip teams. Uh, the two things became really clear. One is, oh my goodness, these worlds were speaking different languages, the way in which they viewed things, the like priorities they had that were just sort of on different planes of existence. But at the same time, you realize in order for the company to deliver, you know, these experiences online to customers, these two groups are going to have to get tightly, tightly entangled. Uh, and so that's where it started my fascination with this marketing technology intersection. Allison Hartsoe: [02:29] That's a fantastic story, and I remember those days because I actually started in 1996 and I remember that kind of back and forth between it and marketing. Very, um, very good story. And can you tell us a little bit about the Martech Shell and the, I guess you'd probably called the Martech conference? Scott Brinker: [02:47] Yes. Yeah, we've been running the conference since 2014, and we think of the conference as the intersection of topics around marketing, technology, and management. It's really geared towards a, you know, senior leaders in the marketing organization, a lot of folks in like marketing ops, a marketing, tech leadership, digital marketing, digital transformation. And the reason we think of this intersection is, okay, part of this is about the technology that you use to have new ways of finding and engaging and delighting customers. The marketing mission, getting larger and larger every day it seems. But the reason we include management in this is because to be honest, while there are all these amazing innovations that are happening with the technology, very often their success in a given company depends on the company's ability to adapt the way they run, you know, the way in which they empower people to take advantage of these new tools, the way in which they start to think about things, you know, in a, analytic data-driven way, you know, these tools are enablers. But to take advantage of that, uh, we have to change the way we, we organize and behave. Allison Hartsoe: [03:59] It's so true. And I'm hoping that at some point that you might be able to extend an offer to the listeners of the show because the conference is really right around the corner. Scott Brinker: [04:08] It is. It's coming up April three through five in San Jose, and I'd be delighted to extend a special discount code, a Martech VIP, and that's capital M, capital T, capital VIP. And that code will get you 20 percent off all access, uh, tickets to the show. Allison Hartsoe: [04:29] Oh, fantastic. Thank you. And will you be updating, so I haven't mentioned this, but you put out that infamous graphic that everyone sees and I see numerous companies presentations about the world of Martech. Will you be updating that again this year? Scott Brinker: [04:47] We are in the middle of updating it now. It's a, you know, it's funny when I did the first version of that back in 2011, uh, I just did it myself in the powerpoint. I've had something like 150 martech companies, uh, which at the time seemed like a huge number. Everyone's like, oh my goodness, a hundred and 50 Martech companies. How will we ever keep track of them all? But yes, as we've gone year over year and kept updating that and went from 150 to 350 to 1,000, 2,000 to 4,000, 5,000 to 7,000. Uh, yeah It's become this multi-month, a team project in order to, yeah, just do the research and uh, you know, keep getting that updated. Allison Hartsoe: [05:27] Wow. Do you have the total count for this year? You said 7,000? Scott Brinker: [05:31] It was 7,000 for 2018, and we're still in the middle of doing the research this year to like, see, okay, how did the 7,000 who's still around, who's been acquired, who's, you know, just exited a less happily. Um, and then who are all the new folks who have entered the space as well? So, uh, I don't have an answer yet, but uh, I'm quite certain I can say it's not consolidated down to 12. Allison Hartsoe: [05:55] Wow. That's, that's just amazing. And, and I think everyone would say this, that, that we all appreciate the work you do to put that together and to shape the way we think about the industry as well as to shape the categories. I've noticed that the categories don't stay the same as you go along and that is also because the industry is shifting and it's going through this tremendous change. And, and maybe that gets us a little bit back to the 2019 predictions. Tell me a little bit about the changes that are happening in marketing as you see them and maybe as it relates to the graphic. Scott Brinker: [06:32] It is definitely a world of continuous change. Um, so I think some of the things that are really interesting in marketing technology today, uh, one is, you know, for a number of years marketers felt that they had to choose between two extremes basically suite versus best of breed, right? Alright, sweet, like I can just buy all the software I'm going to need theoretically, you know, from one company, so I'll just get it all from company A, and then everything should just work together, and I'm fine. Versus the other end of the spectrum, which is, you know, the best of breed and say, okay, well I can find, you know, each particular tool that really delivers the right piece for him doing email marketing, the right piece for how I manage my website, a different piece or how I manage social media. Um, but the problem is while those are the best of each, um, you know, the responsibility was then on the marketer's shoulders to connect them together to integrate them. Scott Brinker: [07:30] Uh, and so there were years of debate like, oh, well, which is better for it, you know, the integrated suite with limited choice or the infinite choice with a heavy integration responsibility. And what's happened is steadily over the past few years we've come to a place that's actually the middle between those two where a lot of the major suites have gone from being closed suites to really open platforms. You know, they've opened up their APIs, they've developed partner programs to get certified apps. And so what you're starting to see increasingly are these ecosystems, platform ecosystems around these major, um, mark marketing clouds, the now marketers can get the best of both worlds. They pick one of those major marketing clouds is like the foundational system, like the tent pole of their marketing stack. And then they can augment it, you know, been complimented by picking these more specialized tools from the ecosystem and the platform company. And the, uh, you know, a point solution have worked together behind the scenes to make sure those integrations now happened smoothly. Allison Hartsoe: [08:38] I'm going to press on that whole smoothly aspect because I think the, a lot of these platforms were formed by acquisitions and one of the things that drives me nuts is a lot of salespeople for a platform will come and say, oh, we can do this and this and this, but the actual glue under the covers hasn't quite been formalized, and so it's a lot of heavy lifting to get these tools to do what they say they can do. Do you see that changing in 2019 or do you see that not the case anymore? Scott Brinker: [09:10] Well, I think this is definitely a journey. Uh, and one of the reasons why I think these major marketing clouds are moving to more of a platform approach is frankly even within their own portfolio of the different products that they've acquired or built. You know, this is a helpful way to look at how do you make these things work together. Um, you know, I mean, it's one thing to try and very tightly coupled them, you know, by custom integrating them yourselves. But it turns out that's a lot of work. A lot of these companies that have been challenged in the speed in which that happens versus if you try and just take a more open architecture approach to all of the solutions in your portfolio, then you really get to a place where, okay, you know, we have solutions for these six different capabilities and you can buy all six of them from us if you want, but because we've now opened up more of these APIs teacher them, if you want to buy these three from us because you liked the way we do this best, but for the other three, you know, there are other solutions out in the market, but you'd rather connect to them. Scott Brinker: [10:15] Uh, we're now getting the capabilities to make that much easier for you to do. Allison Hartsoe: [10:19] Okay. So I'm gonna, I'm gonna press on this one more time because I think that when you describe that the kind of suite of services and the different things that you can pick from the ecosystem, especially with the open platform underneath, to me, I hear Google, Amazon, and Microsoft in that space. Is that what you see in, you know, the shift from a platform to an ecosystem? Is it away from a traditional technology and into the open, you know, or the cloud vendor is going to take over. Scott Brinker: [10:49] Oh Wow. That's a really exciting way of looking at it. So actually, yeah, Amazon, Google, and Microsoft are great examples of these very, very open cloud platforms. Uh, but for the most part, they're relatively kind of described this out getting too technical there, the sort of lower in the stack, right? I mean they, they, they aren't really about business applications, you know, so much is like infrastructure, you know, capabilities below that. And so where I think you see the major marketing clouds, uh, is really focused on the next layer up, uh, you know, providing these out of the box applications or application-oriented services. But what these major marketing clouds are in a position to have learned from is that the reason Google and Amazon and Microsoft and these infrastructures as a service companies you know, are seeing such growth is because the world no longer wants these closed software applications, you know, they've got all these different pieces of software throughout their business that they need to be able to connect together and one of the key ways to evaluate which application providers hair and go with is their ecosystems, how well does this connect and integrate with the other things I'm using in my business. Allison Hartsoe: [12:03] This is so true. And, and I'll just give a shout out to Hubspot because of full disclosure, we are a Hubspot customer, although that's not how we connected originally. Your CEO gave a presentation in September, and I'll link to that in the show notes, but I thought he was spot on when it came to vision of where the company's going and this interconnectedness, but not just an interconnectedness. It was an inner connectedness to think about how we better serve our customers, which is something we say all the time on this show. So I really liked the direction HubSpot's going, and I can certainly appreciate firsthand the interconnectedness that we get from, uh, email all the way through the website and into the services side. It's really cool. Scott Brinker: [12:49] Yeah, it's a very exciting direction, and I think what gets me so excited about it is recognizing that one company does not have all the answers, right. I mean, this is such an innovative and rapidly changing world that the key to success moving forward isn't about one company that has all the answers. It's about one company that like, can help orchestrate or bridge to this incredible variety of innovators and entrepreneurs who are bringing all sorts of new ideas, you know, to the market at a pace that frankly, larger companies had never been able to keep up with. These open platforms really changed the clock speed, uh, at which, uh, uh, the technology world, you know, can support, uh, where businesses are going. Allison Hartsoe: [13:35] It's funny, I always saya internet time is twice what it is in the real world, you know, if it's six months, it's a year on the Internet. Scott Brinker: [13:43] Yep. And we have to find, I mean, I would say like the big challenge for marketers is the speed of change, you know, how do we keep up? Allison Hartsoe: [13:51] I love that. Okay. Let's talk about another prediction. What else do you see happening in 2019? Scott Brinker: [13:58] So one of the things when a, uh, the advantage of looking at thousands and thousands of different Martech companies for that matter is he definitely start to identify patterns. And it used to be a that, you know, one of the patterns was software companies were very different than services companies, right? Uh, and this went both ways. It was like, okay, services companies generally didn't have software products of their own. They were largely just selling, you know, projects or selling hourly billing, you know, or some sort of other commission based structure there. But then also on the other end of the spectrum, the software companies, particularly those who had been funded by VCs, you know, VCs for a number of years, we're in a mode of like, okay, well I mean the only scalable revenue is pure subscription product revenue. So you shouldn't be getting involved in any sort of services offerings. Scott Brinker: [14:51] That's just not efficient, you know, and so there is this real dichotomy between services companies and software companies. One of the challenges that created was in general, the services companies were falling behind in their ability to even understand what the technologies were and how to really be able to leverage them for their clients, and on the other end, the, the, you know, the software companies, they'd be able to sell marketers these amazing tools, but in many cases, the tools were so advanced and so sophisticated. Marketers didn't even really know, okay, we've, we've spent the money, we plugged it in, but how do we actually use this to, uh, you know, get results. And so what's been interesting to me is I'm now seeing from both sides that boundary between these two worlds is really starting to disappear, uh, that I'm increasingly seeing services companies that are building software capabilities themselves because they see this as a way to really stay on the cutting edge of serving clients. Scott Brinker: [15:51] Uh, you know, as best as I can, but I'm also increasingly seeing the software companies in this space start to offer more services themselves. You know, and it's everything from, you know, more advanced onboarding services and training there to even more of these hands-on consulting roles of okay listen, we're happy to sell you the solution that has all these amazing capabilities, but what we're also in a position to do is have people work with you side by side over the next six months to really help build your internal capabilities from a human resources perspective, from an organizational capital perspective to be able to harness these capabilities. Allison Hartsoe: [16:31] And a sense they have to, I can see where the software in where that's always been part of the mix, but now it's an even more important part of the next. Because as you said it, the software is becoming more advanced. What's I think more interesting is the services side that the services companies are building software because that seems like a larger shift. Scott Brinker: [16:50] It definitely is. Marc Andreessen or the famous guy behind a Netscape in 2011 had this editorial in the Wall Street Journal where he said the software was eating the world. You know, and everyone sort of nodded their head and like, yeah, yeah, I guess that makes sense. But you know, if you extrapolate that, what it really comes down to is it's hard to find a business these days that isn't going in the direction of being a quote and quote software company to some degree, right? We have to think about like, okay, how do we leverage digital technology to, uh, you know, serve our customers in this new environment, uh, you know, deliver a great experience through these touch points that are all being mediated by computer channels. So yeah, it's, it's just, it is really asam tonically every company to some degree is becoming a bit of a software company and services companies, uh, are certainly no exception. Allison Hartsoe: [17:45] So what an example of that be like, take an agency for example, that during a lot of advertising and a lot of placement and an example of the service company building software might be their own proprietary platform or their own reporting visualization that they put the company on. Would that be a good example of what you're talking about? Scott Brinker: [18:04] Yeah. And so here's one of the things that's interesting is this is why this actually dovetails with that platform movement, uh, you know, that we were talking about earlier is because the major marketing in clouds is building these foundational systems and opening them up. It actually now makes it easier for service providers to say, okay, we don't have to reinvent the wheel here. We don't have to like for instance, create our own, I don't know, custom email delivery engine, right? We could, we could buy that virtually off of the market, you know, but what we can do is using the open APIs and those platforms is if we have our own secret way in which, oh, okay, here's how we want to sequence, you know, particular, uh, and touch points in email touch points and the way in which we want to manage a, you know, testing for optimizing the conversion of different segments of customers, making their way through different paths on these different touch points, like they can create their own little bit of software. It doesn't have to be a huge software project but becomes a way of scaling their insight and their knowledge and how they, they work in a way that they can then package up, uh, and make more efficient for a larger set of clients. Allison Hartsoe: [19:16] Yeah. I can't say we haven't taught thought about that ourselves. That makes perfect sense. Let's talk about the third prediction that, uh, you think might be happening in 2019 in the marketing space. Scott Brinker: [19:31] Yeah. So all these things kinda the dots connect to each other. And the third prediction I would have is we're going to see more individual companies also doing a little bit more software development themselves. Um, you know, for, for a long time in marketing, uh, years ago it was always this debate between build versus buy, do I build my own custom marketing tech or do I buy a commercial solution off the shelf. And for, and for many years, you know, we've sort of moved into the direction of saying, oh, well I'll just buy these, you know, complete solutions off the shelf. But we've sort of reached a tipping point, where now, because the solutions that they're buying are these open platforms, and they have these open APIs, you know, companies are now in a position like where they can pick, you know, like a foundational marketing cloud, you know, for their business, but they can now augment it with their own special apps that they want to create for, hey, okay, this is going to be our own mobile app that we're going to use for customers to, I don’t know, like if I'm a catering business and I want to let people be able to, you know, order things and make sure they can track, you know, how these things are being assembled and delivered and give reviews. Scott Brinker: [20:41] I mean, they can basically architect these whole little digital customer experiences on top of these platforms. Uh, so that's a really exciting trend. And what's interesting is, okay, one way you do that is if you actually have a software developer in your firm who can build those things using true software programming languages. But what's really interesting to me is we're increasingly seeing these new tools called application platform as a service tools, uh, that are these no-code solutions to let nontechnical people using these drag and drop interfaces, be able to create little applications with their own like mobile applications, little web applications, maybe a little workflow applications on the back end of their office. And so a, again, this is going back to the Marc Andreessen quote of, you know, software eating the world is just slowly we're seeing every company out there being given the capability to customize their software stack for their own particular business. Allison Hartsoe: [21:46] Oh, that's fascinating. So I'm going to ask you what, what are some of the tools in that space? Like my son uses scratch to essentially quote program, but it's really almost like a drag and drop interface, similar to what I imagine you're talking about. Scott Brinker: [21:59] Yeah, scratch is actually a great example of that sort of capability. Um, so on the commercial side of this, man, there's a ton of them. Uh, Google actually in g suite they have a little app maker, uh, application. So you've got Gmail, you got slides, you got docs, and you have app maker, you can make a young little dragon drop apps. There's a Zapier to, you know, can be used to connect all these different cloud services and create these custom little workflows of somebody fills out a form on my website here, I want to take that data, I wanted them to route that to my marketing automation system, maybe copy these fields over to my CRM. If it meets these criteria, then I want to trigger a message on the slack channel. Um, and, and this is all being done through this really simple user interface that you don't have to be an enterprise architect, you don't have to be an it professional, you can just frankly be a marketing power user, you know, that knows how you want to move data back and forth between different cloud apps. Allison Hartsoe: [22:57] That's fantastic. Do you think that's part of the space now because there's such a choke point for talented developers and when you can't get enough, a tool will arise to start to solve that problem for us? Scott Brinker: [23:11] Yeah. And, you know, again, this goes back to what we were talking about earlier that, um, you know, the number one challenge businesses in general have, is keeping up with the pace of change. And so as a result, anytime that you have this choke point where you're like, oh, okay, I want to analyze this data, but in order to get this analysis I have to fill out a ticket, and then, somebody often the data analysis team will eventually get to it in bold the data and get back to me. No, I mean we live in a world now where if a marketer wants to analyze how a particular campaign perform so that they can make a decision that day about whether to increase, you know, perhaps ad spend on that particular campaign and give them these citizen data analysis tools, things like tableau or looker where they can just immediately see, find the answers themselves. You know, that's so empowering. It just accelerates the clock speed at which business operates. And so, these developer platforms, you know, and things like Zapier for citizen integrators, um, or google app maker for citizen developers. Yeah. It's basically about giving people at the front of the organization the ability to answer their own needs to self serve their own needs as much as possible and not have to have a choke point. Allison Hartsoe: [24:26] Yep. That's a perfect solution. Want to ask you an interesting question that we didn't talk about it in advance about what you might like to see that's not happening yet in this space if we turn predictions upside down? Scott Brinker: [24:41] That's a great question. I think directionally I'm really excited by where everything is headed. I think for me it's, it's, it's mostly about the speed by which we're moving on this journey because you know, this idea of, okay, these open platforms that let you easily integrate solutions from ecosystems, uh, you know, this layer of citizen developer capability on top of that, which makes it very easy for nontechnical people to create their own apps or orchestrate how this stuff works. If you look at what exists today, we're good ways down that journey, but we've still got a ways to go. Like I compare it to like a, I'm an iPhone user, so like, you know, when I go and, you know, get an app from the Apple APP store. I mean, it just plugs right in, there's a consistency to the user interface, um, you know, assured of a, you know, the basic security, the way in which they previewed those apps. Scott Brinker: [25:37] Um, you know, when we look at, uh, you know, business platforms and marketing platforms, it's not yet that standardized, it's getting better at the integration between these things. But even, you mentioned it earlier, right? Even within a company's own software products that they might have acquired from several different companies, they're not yet perfectly integrated. They definitely got every, the direction they're headed is great, but we've got a ways to go. And so I don't know, I guess what I'd love to see us do is just, uh, you know, I think the vision of how this can work better is now very clear to everyone, and we just have to put our heads down and make it happen. Allison Hartsoe: [26:15] Yeah, that's a really good point. And I oftentimes think about that in terms of the customer, and I see these tools rollout, and they talk about, oh, we're going to optimize when you send your email, or we're going to optimize different aspects of a channel. And that drives me a little bit crazy because I think it changes the focus from people who are making a bid for attention to understand whether they should buy from your company to see if your product fills a need and it shifts that focus from people into channels and how can I hit this person more through this preferred channel which was, which is really kind of a little bit circular and try to get them to buy more. So the thinking hasn't quite disappeared from where the funnel is. I think marketers today, and perhaps this whole generation still thinks funnel funnel funnel. I get, you know, x number of people in. I get marketing qualified leads. I churn them through the funnel, and eventually we get sales out the other side. And that's not wholly untrue, but I think I'd like to see marketers shift to a quality paradigm where they're really thinking about who are they talking in to and how much email are they sending and is it actually a quality operation or are they just sending out more noise? Scott Brinker: [27:41] That's a great point. Our CEO at Hubspot, Brian Halligan, he gave a presentation a few months ago where he shared that, you know, in the early days of Hubspot, the way we got customers was we created a whole bunch of content. You know, we were like the champions of inbound marketing, create great content, people find that they fill out forms, they become leads, and it's the funnel from there. But over the past several years that's changed. And the number one source of new customers for Hubspot is, drum roll please, referrals from existing customers. And it really starts to, you know, I mean the mind starts to realize the way he framed it is, it's not so much a funnel as much as it is a flywheel, you know, and that getting customers who are happy and successful with your product actually becomes the engine of growth for driving new customers. And like when you shift to that sort of worldview, yeah, it gets you out of this mode of like, okay, how do I like to slam this set of prospects with as many touch points in as many channels, you know, in as little time as possible to how do I make sure that when someone actually becomes a customers, they have a fantastic experience and that I can't wait to share that with their friends and colleagues. Allison Hartsoe: [28:53] Yeah. And I'm actually gonna call out Bryan Eisenberg here, who we had on the podcast, gosh, probably back in June, and he talked about his book, Be like Amazon even a lemonade stand can do it. And it was exactly built on the flywheel effect. Referrals becoming the engine of growth and if you do the math of customer lifetime value, it is exactly driven by that same heart of good customers and good quality, and also I'll call out to Dan McCarthy's podcast, which is out this week and he's talking about how they're trying to get Wall Street to think about the business operations should be geared on quality of customer, which is the retention. Retention is measured the quality of your base as opposed to new customers every quarter, which is an acquisition metrics, so you can burn through lots of new customers and get a great value on Wall Street but still be a crappy company, but companies that are retaining are not. They're really high quality, and they deserve a premium. Scott Brinker: [29:53] Yeah. That's one of the hidden incentives of moving to the subscription oriented economy and I think is really gonna pay off well is because yeah, all the models for subscription oriented success are predicated on the retention rate of the subscribers you acquire. By the way, I will echo the shout out for Bryan Eisenberg. I love that book of his. Brian is one of the people who I'd say has been most influential to me, uh, over the past 15 years in my work in digital marketing, uh, way back when I was doing conversion optimization for a living. Great to great to hear his name come up. Allison Hartsoe: [30:30] You know, it's a funny story. I didn't have a relationship with Brian but I have picked up his book so I was in between companies and I picked up his book about waiting for your cat to bark and I read it and I reached out to him afterward, and I said, you wrote this book, it must have been five, 10 years beforehand. And I said, and all of this stuff still applies. Why haven't people taking this advice? And I think it gets back to what you said at the beginning of the show, which is marketing is difficult. There's a lot of levers, there's a lot of things to figure out, and you know, you only have so many tools at your fingertips. And so when tools in the landscape make it easier to solve those choke points and to help us do our jobs as marketers, then everybody wins. And some of the sage advice that's maybe been sitting out there can start to get baked into the way we operate today. Scott Brinker: [31:23] I couldn't agree more. Allison Hartsoe: [31:25] Excellent. Well, Scott, thank you so much for being on the show. Are there any particular tactics that you want people or things they should do now that they kind of see where things are going in the space? Any recommendations you have for listeners on the show? Scott Brinker: [31:41] So, you know, one of the things, uh, because I assembled that a huge graphic of all these different martech solutions, uh, is I think sometimes people think that I'm advocating like, Oh wow, you should go out and buy as many of these as possible Martek, Martek, Martek, Martek, shiny object, shiny object. And actually I couldn't feel more strongly the other way, which is, you know, again, I think there's a tremendous amount of innovation happening out there, but I think it's really important to keep your priorities that, you know, like the Pareto principle, 80 percent of your focus really should be on getting a small number of tools that work really well. Developing the process and the organizational capital around them so that your teams really using them effectively, like having that as a solid foundation is really the place to keep your focus and then okay, maybe 20 percent of the time, uh, you know, you want to allocate to keeping an eye on new trends that are changing customer expectations, you know, new ways in which customers expect to be able to reach with you or engage with you and to be able to put pilot programs for that. Scott Brinker: [32:51] But do you want to keep those two things in balance and uh, yeah, not get too carried away with the 7,000 Martech tools out there on the planet. Allison Hartsoe: [32:58] Oh, I love the 80 20 rule. I find that it applies in almost every situation. It's a good one. Yes. Yes. And of course, people should come to the show. Can you give us that offer again in case somebody missed it at the beginning? Scott Brinker: [33:12] Absolutely. So yeah. Martech brings together two thousand, uh, marketing technology leaders. Uh, you know, people who are in BTC, B to b companies, helping, helping to figure out how do we put the right tools in place, how do we build the right management capabilities around them to really deliver remarkable marketing. So, uh, yeah, the show in San Jose is April three through five, and the code you can use to take 20 percent off all access tickets is Martech, VIP, capital m, capital t, capital VIP. Allison Hartsoe: [33:48] Thank you so much for sharing that with folks. Now people want to get in touch with you. What's the best way to reach out? Scott Brinker: [33:54] Sure. Uh, well I am chief Martech on twitter, and that's chief Martech without the h at the end. That's a long story. My blog is also chief Martech without an h.com. Uh, and uh, yeah, you can reach out to me@Hubspottosprinklerathubspot.com. Allison Hartsoe: [34:12] Excellent. Well, Scott, thank you so much for having the time and the vision to share with us these amazing predictions. We talked about a prediction of the shift from platforms to ecosystems and the big driver of APIs along that curve, we talked about the rehabilitation of services alongside of tech and kind of seeing more service industries using tech. I love your Marc Andreessen's quote about software eating the world. And then we talked about the change in build versus buy and how the pendulum is swinging back to hear all these things that can make your life easier and easy apps and easy things that you can do to just customize your workflows and make your processes fly. As always, links to everything we discuss are at ambition data.com/podcast. Scott, thanks so much for joining us today. Scott Brinker: [35:07] Oh, thanks for having me. 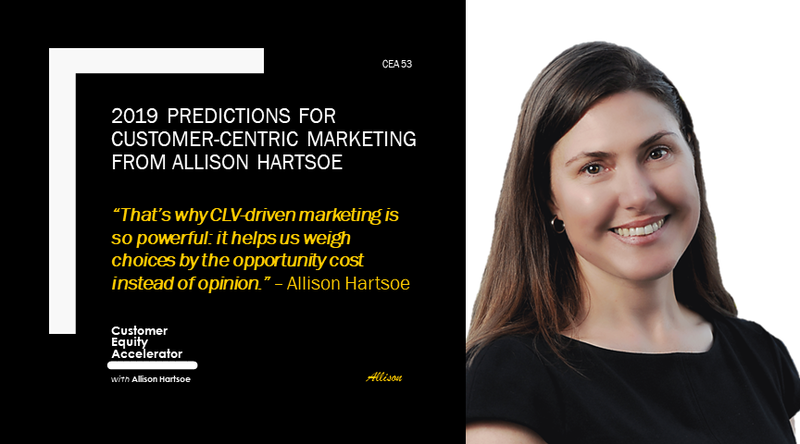 Allison Hartsoe: [35:09] Remember everyone, when you use your data effectively, you can build customer equity. This is not magic. It's just a very specific journey that you can follow to get results. Thank you for joining today's show. This is your host, Alison Hartsoe, and I have two gifts for you. First, I've written a guide for the customer centric Cmo, which contains some of the best ideas from this podcast, and you can receive it right now. Simply text, ambitiondata, one word to, three, one, nine, nine, six, (31996) and after you get that white paper, you'll have the option for the second gift, which is to receive The Signal. Once a month. I put together a list of three to five things I've seen that represent customer equity signal not noise, and believe me, there's a lot of noise out there. Things I include could be smart tools. I've run across, articles I've shared cool statistics, or people and companies I think are making amazing progress as they build customer equity. I hope you enjoy the CMO guide and The Signal. See you next week on the Customer Equity Accelerator.